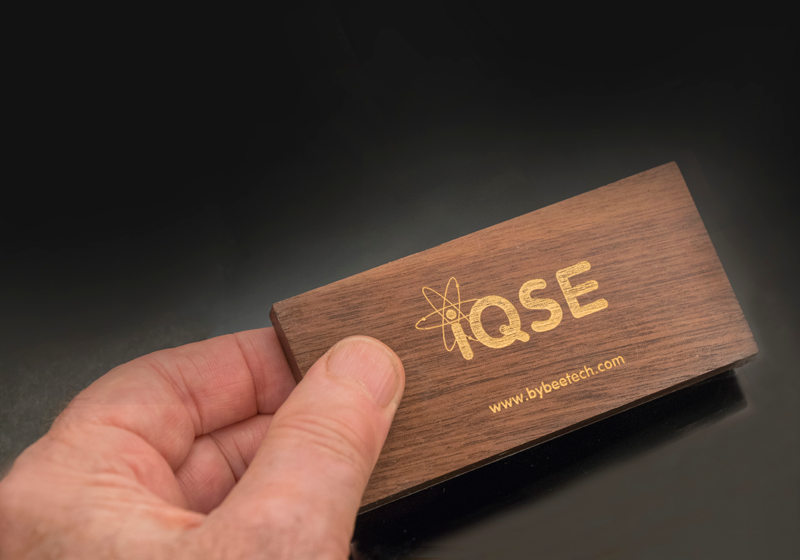 The Bybee Internal Quantum Signal Enhancer (iQSE) is a small 4" w x 2" d x 1/2" h device housed in wood. It is meant to be installed inside the chassis of an audio component bringing it closer to the energy fields generated by the internal circuitry. There is no soldering, or any type of electrical connection required. It adheres to the inside of the component via double sided tape. We recommend sticking one on the underside of the chassis lid away from heat generating circuitry and not blocking air ventilation. Like it's sibling the Quantum Signal Enhancer, it's activated by surrounding electromagnetic energy. Once activated, the electric and magnetic fields effect the polarity (spin) of all electrons and protons in close proximity; affecting their oscillation by making them more aligned with each other. This reaction creates an effect that makes the transfer or sharing of electrons between atoms more streamlined and efficient. The results are a stunningly enhanced purity and energy of a video or audio signal. In the listening room - The iQSE can have a profound effect on the listening room when placed properly. Read more. Near power Supplies of audio components - It can be placed on the outside of a component (usually the underside where the circuit boards are attached), but placing inside the component magnifies the effect significantly. Near digital circuitry - Including DACs, DSP. Near video circuitry - TV's, cable boxes and DVD players benefit as well. Circuit breaker boxes - Set on on top of the breaker box where the power comes in, and place on inside on the panel door near the main breaker and near the circuit breaker feeding your audio system. WARNING! Do not attempt to place an iQSE inside the main cover of the breaker panel, it could kill you. Inside the door of the panel is fine. "The benefits of iQSE blocs are vastly enhanced bass, especially at the leading edge attack. Better definition of instruments and the space around them. Enhanced location cues, expanding apparent listening space, added depth behind the speakers and sonic images extending laterally beside the speakers. I perceive the music floating more independently of the speakers, yet at the same time better grounded. Acceleration of bass attack is noticeable enough to change the pacing, in my system. My David Berning OTL tube amplifiers and preamp, which have proven remarkably resistant to most tweaks, responded positively. Tacking one on the back of each speaker at the terminal panel (presumably near the crossover) was effective in enhancing dynamic range, smoothness and bass harmonics. Placement on top of the speaker at front edge had a beneficial effect of clarifying midrange and encouraging a shimmering, appealing top end. Remarkably, one of the most dramatic effects of the iQSE I experienced was completely unexpected. Among Jack’s beta adopters one reported success placing them at the inputs and outputs of a house electrical utility meter. The mildly magnetic gizmos are easy to place in a home fuse box. I experimented with 2, 3 or 4 stuck onto the face of the breaker switch panel. Wow, the effect was quite rich dramatically infusing the qualities mentioned above. Keep in mind this is a recently remodeled home electrical system. My gear is treated with top-notch power conditioning. Household circuit quieting products from Acoustic Revive, High Fidelity and Akiko have been deployed. Surprisingly images on TV from cable box and DVD player, excluded from my AC power conditioner, benefited greatly though I seldom note or greatly value those kinds of improvements. Color saturation increased dramatically and the details of cosmetics on brightly lit TV faces. As I suggest it’s a very dramatic and quite welcome enhancement to a household electrical system. I achieved best results deploying eight iQSE samples (and I bought them all): 2 at the fuse panel, 1 DAC, 1 preamp, 1 each for the monoblock amps and loudspeaker terminal panels." NOTE: The active elements inside the QSE are specially formed crystals that are resistant to damage and will never lose their effectiveness. Wow! Not since the Bybee Speaker Bullets and SE AC purifiers have we been this blown away by a Bybee product. The iQSE is a VERY significant improvement when properly installed inside an audio component. The background is darker, and low level sonics as well as dynamics are improved. There is a quietness in quiet passages that adds a sense of realness to the sound. Class D amps and DAC's lose any sense of "digititus" that may be causing listening fatigue. They sound much more analog after installation of the iQSE. Where possible, we recommend installing the iQSE along with 2 Bybee SE AC purifiers and our proprietary ground filter on the incoming power. When paired with Bybee's SE AC purifiers and our proprietary ground filter, the total synergy of the effects are comparible to a multi thousand dollar component upgrade or thousands of dollars worth of modifications and/or cabling. A prototype version of the iQSE is attached to the underside of the chassis top on the Aqua La Voce S2 DAC. Want to know how it sounds? Read our review. Have installed one Bybee iQSE in my SACD player (over DAC circuitry) and trialled one iQSE near the Speaker Terminals of my Vandersteen Tree CT's. Results are just stunning with all sorts of positives particularly improved bass and sensational imaging.Worth every cent and highly addictive. Bought 2 Bybee iQSEs and installed one behind the access panel of the breaker box. Installed the other one inside my Bybee Wire power purifier. I figured it was worth a try. I didn't hear too much of a difference at first but after a month I can attest that my stereo has never sounded better. Same goes for the home theater set up. My 51" plasma displays beautiful video. Plan on buying another iQSE. Click the button below to add the Bybee Internal Quantum Signal Enhancer to your wish list.